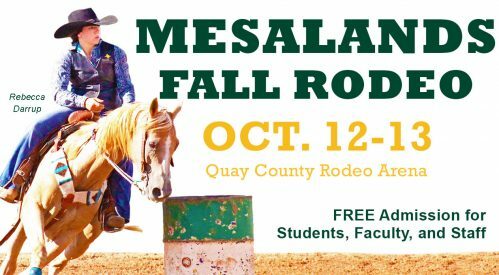 The 11th Annual Mesalands Community College Grand Canyon Region Intercollegiate Fall Rodeo will be on October 12-13, 2018 and will be held at the Quay County Rodeo Arena. The first Rodeo Performance is Friday, October 12 at 6:00 pm. On Saturday, October 13, Slack will begin at 9:00 am (no charge) and the Championship Performance is at 6:00 pm. Free admission for Mesalands students, staff, and faculty (Must show College ID at the gate). Tickets are $5, free for children under the age of 12 (accompanied by a paying adult), and seniors 55 and over are $2. For more information, please contact the Public Relations Office at (575) 461-4413, ext. 138.